in FIFA's most popular game mode. FIFA ULTIMATE TEAM™ is the only place in FIFA 19 where you can build your dream squad! Play your brand of football and develop a team chemistry to defeat your opponents with style. With millions of games played daily, there is always an opponent ready for you to challenge in FIFA Ultimate Team (FUT). Whether you’re looking to grasp the basics of FIFA Ultimate Team or get deeper into EA SPORTS FIFA’s most popular game mode, everything you need to know, from player packs and Coins to parental controls, is right here. With thousands of players available in Ultimate Team, you can build your team just the way you want. There are a variety of player items available within FIFA Ultimate Team and many ways to obtain them, such as opening packs, buying players on the Transfer Market, or completing Squad Building Challenges. All player items have a base type, which is based on a player’s overall rating. Recieved by players with an overall rating of 65-74. For players with an overall rating anywhere between 0-64. These base player items are divided further into two rarity types: Common or Rare. Special player items with enhanced ratings and attributes are also available during specific FUT live events. Get player items by opening FUT packs, buying them on the FUT Transfer Market or completing Squad Building Challenges. In FIFA Ultimate Team, building the best possible squad means paying attention to your players’ chemistry almost as much as their ratings. Your players and your squad as a whole play better when they have strong chemistry links between them. Placing players of the same club, league, or nationality next to one another – the more of these elements that match, the stronger the link will be. Putting players in the positions listed on their item. Using player items with the “loyalty” bonus, which is only found when the item is obtained via pack or after playing 10 FUT matches with your club. Open packs to acquire new players and consumable items to build out your club and enhance your team’s chemistry. There are a range of packs available in Ultimate Team, and they can be purchased using either of the game’s two in-game currencies: FIFA Points or Coins. Coins are earned in-game by playing matches, completing challenges, or selling players on the transfer market – they cannot be directly purchased. The Transfer Market allows you to trade items for Coins and vice versa. You can buy some of your favourite players here or trade items you no longer require with other FUT players. Items in the Transfer Market can only be bought or sold for Coins, and there are many factors that influence the market. Supply and demand, rarity, a player's performance in real-world football, and overall rating can all factor into an item’s price. Achieve greatness on the pitch by adding all-new Prime ICONS to your Ultimate Team. These items represent some of the greatest footballers of all time, and they are a huge boost to any FUT squad. In addition to the ICONS found in FIFA 18, brand-new Icons have been added with FIFA 19, including legendary players such as Raúl and Johan Cruyff. Each Prime ICON has three unique player items, each of which has distinct attributes that reflect that player’s performance during various phases of their career. Adding footballing Icons like Diego Maradona, Steven Gerrard and Ronaldo Nazário to your squad will take your team to the next level. You can complete a variety of Daily and Weekly Objectives to earn Coins, packs, and other FUT rewards. Objectives can be anything from buying players from the Transfer Market to applying consumable items to players in your squad. Objectives refresh at the end of their respective cycles (daily/weekly), so there are always new challenges to complete. Many of these challenges can also be completed on the Web and Companion Apps, so you don’t have to miss out even if you’re away from FUT. Squad Battles is a brand new FUT mode in which you can take on AI-controlled squads of other players from around the world in single player mode. Once you select a squad to play against, you can select the AI difficulty level of your opponent. The higher the difficulty, the better your post-match reward will be. Rack up wins and climb the weekly global leaderboards to earn some of the best rewards ever offered in single player FUT. Play a Featured Squad and test your skills against the squads of real-life footballers, FIFA pros, and celebrities. Watch full match replays from the top players in the world competing in the FUT Champions Weekend League. Control playback and cameras through matches of your favorite pro players to learn how they play and raise your game. Each week there are new matches available that feature full playback control and instant replays. Focus on the action that you want to see in each match with the useful timeline tool that highlights key moments such as goals, red cards, and penalties. Like Objectives, Squad Building Challenges can be completed in FUT on your console or on-the-go with the FIFA 18 Web and Companion Apps. Go for glory in this competitive mode and participate throughout the week in tournaments with various squad building requirements to earn rewards and gain access to the Weekend League. The Weekend League is your ticket to some of the best rewards available in FIFA Ultimate Team. Note that FUT Champions mode in FIFA 18 is a year-long experience. Take your team to the top division by competing online and winning matches. Win against others in your division to make your way to the top. But be aware: as you progress, you'll encounter tougher and tougher opponents. Win Online Seasons to clinch the season title, then earn big rewards and the bragging rights that come with it. As with most real-world football leagues, you get three points for every win, one point for a draw, and zero for a loss. Get enough points to escape relegation, achieve promotion, and go the extra mile to win a championship trophy and the extra rewards that come with it. Draft a squad and challenge opponents in a tournament to win Coins, packs, and more. This mode will test your teambuilding skills as you pick the best fit for each position from a five-player draw. Make your FUT Draft choices based on player quality or team chemistry, and then challenge opponents in a series of up to four matches. Earn bigger match prizes as you progress—win all four games in a row to earn the top rewards. The FIFA 19 Companion and Web apps allow you to remain connected to the world of FUT 18 anywhere and anytime. Featuring full management of your FUT Club, the FIFA 19 Companion and Web apps enable you to prepare your squad for your next big match, bid on a last-minute transfer, complete a Squad Building Challenge, earn rewards for your team, and improve your club with new players and items. With full integration between the Companion, Web apps, and your Console, your club will always be up-to-date regardless of where you are playing. Once you have created a club in FUT 18 on your console or PC, you can enjoy these exciting new and fan-favourite features from your web browser or mobile device. The FIFA Companion App is available for iOS and Android devices. 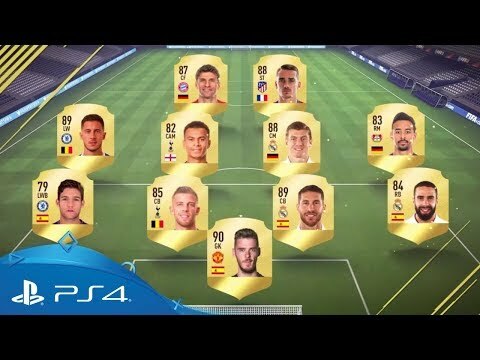 When accessing FIFA Ultimate Team online via the Companion App or Web App, it is possible to set up the account for your child and place any restrictions you wish on the FIFA Ultimate Team online account. If you’re setting up an Origin Account (needed to access the Web app) for your child, we suggest first creating your own Origin Account, and then using the email registered on your Origin Account as the “Parental Email” when setting up your child’s account. This will ensure you’re able to contact customer support whenever your child has an issue. Also, there is no need to put your credit card details on the console/system in order to allow the gamer to purchase packs. Simply pick up a FIFA Points card at your local retailer – this way you’ll be able to purchase points without ever having to supply your card details online.